Tuesday Tasting is a regular feature of Lyke2Drink that explores some of the best beers, wines and spirits on the market. This week we sample two ales launched by Anheuser-Busch. They will soon formally be part of the mammoth (we used to call them "giant," but after this acquisition we needed to find another adjective) Belgian beer company InBev, but the folks at Anheuser-Busch continue to extend the Budweiser and Michelob brand families. Two packages arrived at Lyke2Drink recently that contained ales under both labels. In a departure from other recent intros by these brands, such as Bud Light Lime and Michelob Ultra Fruit, these brews were dark and offered a more traditional beer direction. I found one to be impressive and the other leaving me wanting something more. Michelob Dunkel Weisse: This unfiltered dark ale is new to the Michelob line up, but if you have been to Colorado over the last year or so you might have had it under the Ascent 54 name. It was brewed in Fort Collins and was part of A-B's regional specialties push. This beer is a cloudy reddish brown color with very nice flavor elements. Inviting chocolate malt, a touch of banana and hints of dates and citrus. This just might be the best beer I've ever tasted from A-B. It is worth seeking out. 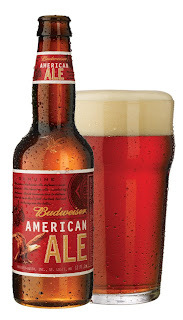 Budweiser American Ale: This brew started to impress me when I poured it. The color was a nice tarnished copper and the head was rocky and firm. Perhaps it was this promise that left me a little disappointed. The brewmasters at A-B have built a drinkable ale -- perhaps a little too drinkable. I was looking for hops and I did not find that many. The malt really is the story here. It could be a bridge beer for some Bud drinkers to move towards brews with more color and flavor. It's too bad this is not the standard Budweiser. It would be a good jumping off point and likely change the perceptions most beer enthusiasts have towards the brand. There is nothing "wrong" with this beer, but if your first thought about a great domestic ale is Sierra Nevada Pale Ale you will likely be left wanting.